Here are 3 proven methods for measuring Cc, each showing you what to expect in your test tubes. You can use the apps to plan your tests, then to analyse them. These aren't just pretty pictures - these are formulation tools that I and many others use on a regular basis. There are 3 types of Cc scan. Each type has its own good and bad aspects - and one key aim of this page is to allow you to choose the best scan for your particular circumstances. But whatever the scan, the starting point is a 50:50 v/v O/W mix with, typically 3-6% of surfactant. 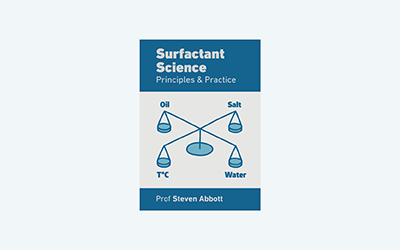 Select whether the surfactant type is ionic or non-ionic, the number of tubes (from 5 to 16) and your known values such as surfactant Cc or salinity (range). Temperature is assumed to be 25°C. As you change the Cc of the surfactant with the slider you get a simple visual idea of what the scan tubes might look like if your unknown surfactant had that Cc. Below each tube is key information of what is going on. To interpret a real scan, move the Unknown Cc input so the tubes match the scan. That Cc value is the value for your unknown surfactant. Real tubes can often look rather different, but by comparing your real scan results to this idealised picture you will be able to pin down the Cc to the accuracy set by the limits of your scan. Note that with the wrong choice of input values it is possible that you will see no change across the whole scan range. When this happens (in real life and in the simulation), the trick is to see if the tubes have a larger water phase (meaning that some of the oil is in the water) or larger oil phase (meaning that some of the water is in the oil) and therefore knowing in which direction the known surfactants have to be shifted. In each case the %Surf value is meant to illustrate the fact that more surfactant gives more solubility and therefore bigger differences between the phases. The value varies from 1 to 10 for convenience and the effect is exaggerated. Choose the EACNs of your two oils, your salinity and class of surfactant. An alternative is to choose a known surfactant and a known EACN and scan the mix of the two surfactants. The MWt of both surfactants needs to be known because the mixing rule depends on molarity. A third method is to choose an oil with known EACN and to vary the salinity. If the surfactant can survive high salinities then this can be an excellent, accurate way (often used by academics) to pin down a Cc. The values of S-min and S-Max set the range of the scan.